High in fibre, this premium, natural Colon Detox is the ultimate Colon Cleanser. 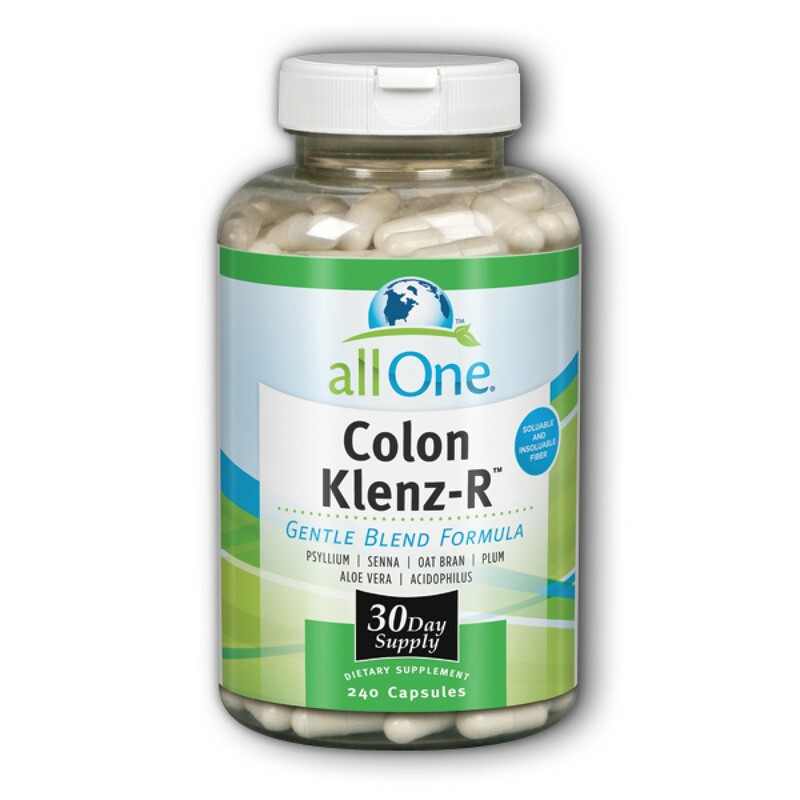 Colon Klenz-R is a home colon cleanse programme that is natural and easy to use. Simply take 4 capsules, twice daily with your two fattiest meals and let the tablets work their magic! The average person on a typical Western Diet holds 8 meals of undigested food and waste material in the colon. Everyone would benefit from doing a Colon Cleanse Detox at least once per year, with ongoing colon maintenance when necessary. A good Detox programme should always begin by removing the waste in your colon as this is the last portion in your food processing chain. If you attempt to clean your liver, blood, or lymph system without first addressing a waste filled bowel, the excreted toxins will only get recycled back into your body. Similarly, if you are wanting to lose weight, colon detoxification should always be the first step in your weight loss programme. One of the most frequent bowel problems that people experience today is constipation. Constipation is generally attributed to a low fibre diet and lack of sufficient water, which causes the faecal matter to become condensed and compressed. In a constipated system, toxic waste matter sits in our bowel putrifying, becoming rancid and fermenting. A constipated system is one in which the transition of toxic wastes is slow and the consistency of the stool can cause strain. Over time, this may cause haemorrhoids, varicose veins, hiatus hernia or other mechanically induced problems. The longer the "transit time", the longer the toxic waste matter sits in our bowel which allows proteins to putrify, fats to become rancid, and carbohydrates to ferment. The longer your body is exposed to putrifying food in your intestines, the greater the risk of developing disease. "the much more serious problems of colon cancer and immune system dysfunctions begin with a toxic bowel"
Bran and raw vegetables are so rich in fibrous bulk that they cannot get through the tiny holes in most colons. Instead they back up, fester and contribute further to the problem There is only one good way to clean yourself out and that is to cleanse your colon. Even with one bowel movement per day, you will still have at least three meals worth of waste putrifying in your colon at any time. The much more serious problems of colon cancer and immune system dysfunctions begin with a toxic bowel. Colon cancer is now the third most common form of cancer worldwide and is the second leading cause of cancer-related death in the Western world. Cleansing the colon is a simple preventative measure that helps to excrete putrifying matter. "everyone would benefit from doing a Colon Cleanse Detox at least once per year"
Dosage can be halved for a more gradual detox. Take four capsules per day after your two fattiest meals of the day with a full glass of water. For most people this would be at lunch and evening meal times. For those with a slight build, this can be reduced to three capsules with the two fattiest meals. Drink plenty of water. Most people feel a big difference in the first week of use. After the 1st month, for maintenance use for 5 days for vegetarians and 7-8 days for non vegetarians. Note: Results may vary from person to person. My bowel was damaged during emergency surgery and for 6 years now I have been trying to find a way of keeping it working properly, like someone else said its not always possible to achieve that by simply eating fruit and veg! I thought I would give this a try and have to say 'it does what it says on the tin so-to-speak. However, it really is not the sort of thing to try during the working week and I would suggest planning it for a weekend or a week off. I personally found that 8 tablets a day were too much so I reduced the dose and only use them a couple of times a week as that seems to be enough for me. AFTER SPENDING A FORTUNE ON SIMILAR PRODUCTS THAT DID NOT BENEFIT ME, THIS PRODUCT IS BY FAR THE BEST YET. After suffering dreadful pains, and bloated stomach, I started on the Colon Klenz as well as Acai Berries and within 48 hours my probems had been resolved. Granted I had to use the loo about five times a day when I first started, but after a week or so I settled down and now my use of the loo is near normal. In additon I have lost about 2 inches off my waist; and my stomach and spare tyre are much diminished. I started this block yesterday and I am already seeing results. I have felt alot of bubbling and movement as things are working thier way out throughout the day, there have been occasions where it has been a little painfull but no more than what you may experience with period pains. I tend to agree with the more positive reviews regarding this product. I feel much better overall for taking this supplement and after my intial doses have reduced my daily intake to four capsules (2x2) and still have favourable results. My experience with this product was pleasant and I didn`t have to hang onto the towel rail as has been my experience in the past with much more expensive products. I feel healthier in myself too - and have lost about a stone in weight. They have helped stop me from unecessary snacking in between meals, helping to regulate my appetite. got to say mix these with pure acaia berry and u are laughing its been awesome losing weight and feeling good with these,i also train but with these i have dropped 2 jean sizes,i will be ordering more very soon. great product Review by Ms. S. R. Lines "susan"
wow this really works!!! Review by S. Mcdonald "sherry"
I represent Perfect Shape - we're the UK distributors for this product - now with this disclosure out of the way, here goes with this review of my experience, or rather my wife and I's experience using this Colon Cleanse Product - Colon Klenz-R. I mentioned this product to my wife when we first started stocking it. We've been interested in the whole detox and cleanse concept since a friend of ours Anita (she'll be happy I mentioned her for sure!) who is a vegetarian did a colonic irrigation a few years ago. Much to her surprise, some red meat was expelled from her colon as part of the process. She told them this was impossible, as she was a vegetarian, so they asked her when she last eat meat. She had been a vegetarian for over seven years! The manufacturers recommend you take it as follows: four capsules, twice a day with your two fattiest meals. For us, this was lunch and our evening meal. You also need to drink plenty of water. They suggest taking it every day for the first month then for maintenance 3-5 days per month for vegetarians and 5-7 days per month for meat waters. The labelling on the product could be better but maybe it's the US FDA rules that prohibit what you can say on natural products. We are tryinh to get the labelling changed though as we've had a lot of questions about how to take it. For the test we also took Enzyme Plus Enzyme Plus Digestive Support 180 Tablets which the manufacturers advise for best results. 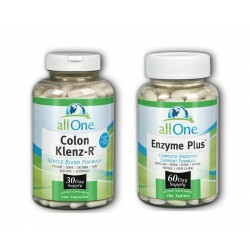 Enzyme Plus is a digestive support product that helps kick start your digestive system. You can also take it with an Acidophilus Product as well. Within the first 24 hours after taking the products, we both started feeling the results. Having previously alternated between constipation and loose stools before starting the course, I found myself going to the loo three or four times a day. As soon as I had breakfast (a bowl of porridge) I would feel the urge to go shortly afterwards. It was almost like being back to a baby where you eat a meal then go etc. etc. In fact I would suggest planning for a quiet weekend and starting the course on a Friday afternoon because when it kicks in, it really kicks in. After about day three I started having a few aches in my lower abdomen. This was the toxins working themselves out of the body and the manufacturers suggest that if this does happen, persevere and keep taking them but drop the dosage. I decided to cut down my dosage to six a day, but my wife continued with eight as she felt fine. Into the second week, we both felt like we had a lot more energy, and by the end of the month's course I had lost a bit of weight round my abdomen. I'm not sure how much as that wasn't my reason for taking the course, but it was a nice bonus. My wife didn't lose any weight I might point out but she's not exactly got much to lose! Some people who are trying to lose weight take this with the intention of losing weight. It may as in my case, but that's not the aim of the product. It is the first step before you try to lose weight in preparing your body for weight loss by cleaning out the toxins. If you look at a diagram of where your colon is, it goes past many major organs so if you have undigested food, and toxins in your colon it's difficult for the food to pass through quickly. If you're looking to lose weight, I would personally suggest starting off with a Colon Cleanse then moving onto a product such as Acceladrine Acceladrine Stay Lean Guaranteed Weight Loss Slimming Formula 120 Capsules which gives you guaranteed weight loss. I personally experienced that it's a great product and my mother-in-law and now father-in-law and brother-in-law have all asked to try the product as we've told them about it. Surely that speaks for itself. These poo pills are fantastic! I am not the kind to normally discuss my bowel movements to the general public but i am ecstatic about this product and i just want to let everyone who is thinking about ordering these capsules about my experience. Firstly i was amazed to how quick this product arrived on my doorstep for starters which was great due to the fact i was quite looking forward to trying yet again another product which could possibly help me. I have suffered from I.B.S from as far back as i can remember and have always suffered from the terrible bloatiness and constipation of this condition. I have tried so many products now which might i add have cost me alot of money that i had finally came to the decision to just live with this chronic pain and lethargy. That was until i read the reviews about this product and thought i would give it another go. The last chance so to speak. In one review it advised to take 4 capsules 2 times a day with the fattiest meals of the day and that is what i have been doing. By the second day the cramps started in which i do have say did get very uncomfortable at one point but i was determined to see it through (so to speak). Now my first worry was that i would be running to the bathroom every 5 minutes and live with the threat of wearing some sort of adult nappy throughout this treatment....but i have to say it was far from that with me. Granted i did go to the toilet about 5 times the second day but hey it did what it said on the packaging......cleansed. The next day i didn't actually do anything in that department but to be honest i think my whole colon was running on empty by then from the day before, which might i add was great and finally i had finally no bloatiness, no build up and had more energy. I am now on my 6th day and i can't give this product enough credit and it has literally changed my life already. I have lost 2 pounds in weight by just going to the toilet which is just not right...... but great.